Let The Sun Rain Down On Your Solar solidifies abstract ideas and dreams into concrete form explaining How To Build And Power A Perfect Off-Grid Home. How? Spanfelner, who built a remote off-grid home with husband Gary 9 years ago, offers practical advice to navigate the complex, perplexing process – simplifying it with step-by-step instructions. Ms. Spanfelner does a wonderful job researching and explaining the step-by-step process of a life-changing project in a manner both personal and universal...The Introduction: Where It All Began is very romantic. And the closing is inspiring -- with her thanking God for the success of the project. It is gratifying to know many others will be able to learn from this couple’s thoughtfully described experience. A must read for anyone considering living off grid… avoid the pitfalls of building as well as the steps to take when considering this lifestyle. As she takes you through the steps with insights and humor you’re caught up in their struggles and triumphs. Whether considering a cabin or mansion, this book is for you. This book is the most intelligent, rational, practical and even entertaining How To Book I have ever read. Reading How To Books is one of my hobbies; one never knows what one can learn from them. 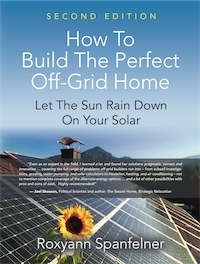 I consider this book a role model for Off Grid construction of homes and larger buildings. The only thing missing is a better close-up picture of Roxyann -- and well -- of her husband too. On a scale 1-10 I'd give the book a 10. 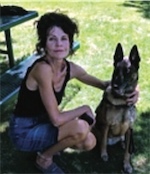 Spanfelner and husband Gary live on their off-grid cattle ranch with Greta, their Belgian Shepard, joining about a million others across America. Maybe you should too! If you’re on the fence, this book will have you leaping over it into “greener pastures” –reaping the rewards of total self-sufficiency.